Easy Way:How to find 3rd higest salary in sql server ~ Dot Net Tutorial For Beginner. 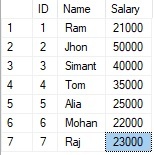 In this tutorial, I am going to show how we can find the 3rd highest salary in SQL Server. In below, the method I want to show you a very easy method so it will help to understand better. The method will take three step so please understand every step carefully. Let suppose the above record is a table, now we need to find a salary from current table record.